The Catch ‘n Keep Fee Fishing Trout Pond was originally created for the kids... but the adults love it just the same. Enjoyed by all, it's literally a net full of family fun!! The pond with the fountain is located beside the lodge in the log cabin area of the resort. It holds rainbow and golden trout that mostly average between 1 to 1.5 lbs. Catch as many as you'd like for $4.50/lb. live weight. Cleaning (fillet or gut) is optional for $2/trout. If you forgot to bring your fishing rod, we have rod rentals available for $3/rod. We also sell bait, tackle and apparel at the Trout Shack. The Trout Shack is where you will check in before and after fishing. It is located beside the pool in the log cabin area of the resort. All fishing is done by appointment only. Please contact Smoke Hole Outfitters to make your appointment. Do I need a fishing license for the pond? No. You do not need any type of fishing license to be able to fish in the pond. Do I need to bring my own pole and my own bait? We prefer that you bring your own fishing rod and bait if that’s what you are comfortable with. If you don’t have a fishing rod, we do have rods for sale, or you can rent a fishing rod for $3/rod. We also have many bait options for sale in the Trout Shack. What kind of bait can we use in the pond? You can use anything from spinners, trout magnets, power bait and worms. Any live or artificial bait can be used in the pond. We don’t want to keep any. Can we throw them back? There are absolutely NO THROWBACKS in the pond. You must keep every trout you catch. Once a trout has swallowed the hook, it will die. If people throw the trout back in the pond, we end up with a lot of dead fish. We have a Catch ‘n Release stream available for those who want to fish, but do not wish to keep any trout. 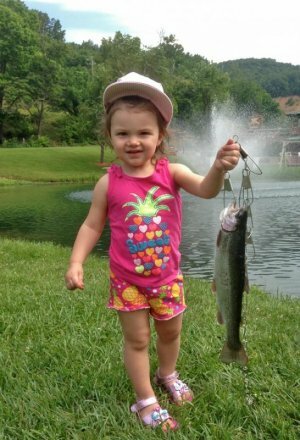 Do we have to be a guest at Smoke Hole Resort to be able to fish? Everyone is welcome!! Whether you are a guest staying at Smoke Hole Resort, or you’re staying at another location, or if you just happen to be passing through... Anyone can fish. Just make sure you call us first to make an appointment. Will a guide be with us while we are fishing? This is different for each group. If you are a first time or beginner fisherman, or simply just don’t want to touch the trout or take the hooks out of their mouths, we will be more than happy to assist you with any help you may need. If you are an avid fisherman, or just simply a couple wanting to enjoy a romantic time together, you are more than welcome to fish on your own. However, because you need to be signed in and the trout need to be weighed at the end of your fishing experience, there will be a guide in proximity and available when you need them. Why do we need to make an appointment to fish? Since this is a seasonal business, there are times that are really slow. We cannot make this business a full time commitment to make a decent living. It’s more like a part time amenity to the activities at the resort. Therefore, if you are traveling from another area, please don’t assume that someone will be sitting at the Trout Shack ready to assist you. Running the resort is a full time job in itself, as we are busy working on other things. As customers call and want to fish, we stop what we’re doing to accommodate them. We do not have someone sitting at the Trout Shack all day, every day. Appointments need to be made in order to fish. Please do not be discouraged by this. We try our very hardest to fish whenever anyone calls and rarely turn anyone away. If you are traveling a great distance, please try to give us a couple days notice that you will be coming. Occasionally we do close when we are out of town. Where do the trout in the pond come from? We spawn and raise some ourselves, but most of the trout are purchased from the West Virginia University Aquaculture facility in Wardensville, WV. How do you get the trout here? We had a very large trout tank custom built with several aerators installed to provide enough oxygen in the water to transport the trout for up to a 2 hour haul. The tank can hold up to 700 lbs. of trout at one time. Why are they $4.50/lb? That seems expensive! I debated whether or not to put this question on here, but it is one of our most frequently asked questions. We do not purchase our trout for much less than that. Once you add in all the time, gas and expenses it takes to stock the pond...then feed them high protein food on top of that, then take the time to help customers fish, we really just come out even. We originally built the pond with the kids in mind. It’s not a huge money maker for us, we just did it for the families to have something “extra” and “fun” to do while they stay here at the resort. 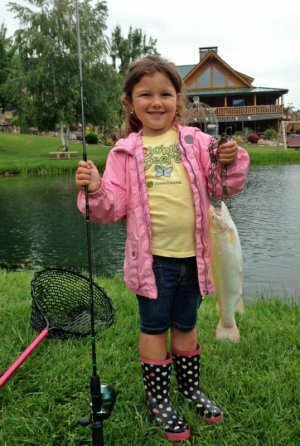 Once you see the excitement in the activity of watching your kids catch a beautiful trout, or even enjoy it yourself, then eating that trout you just caught for dinner, you will see that it’s a lot more fun and memorable than going to the grocery store and purchasing trout for $8.50/lb.